← What to do on a Spring-Like day! Maple Sugar season is almost here – soon the temperatures will be above freezing during the day and below freezing at night and the sap will run! Time to clean the maple buckets, spiles, covers, and collection containers. Time to gather all our supplies and wait for the forecast to call for warming temps. We’ll dig out paths to the maple trees and then dig out our “refrigeration” in the snow. We try to utilize the natural refrigeration the snow provides to keep our sap cold until we have enough to start boiling. The boiling is the “hard” part – it is just time consuming. We boil on the stove since we are a small backyard operation. We boil for 12 hours a day or so and then put the sap in the fridge until the next day when we boil again. The reward is great though – dark rich maple syrup. Dark maple syrup offers the strongest maple flavor and is my favorite – not just for cooking with but also to warm up and pour on pancakes or French toast. Yum! We try to have enough sap to start boiling before our March Maple Madness on March 22nd. This fun Inn-to-Inn event offers guests the opportunity to visit the historic inns of BBInnsMWV while sampling maple treats savory and sweet. 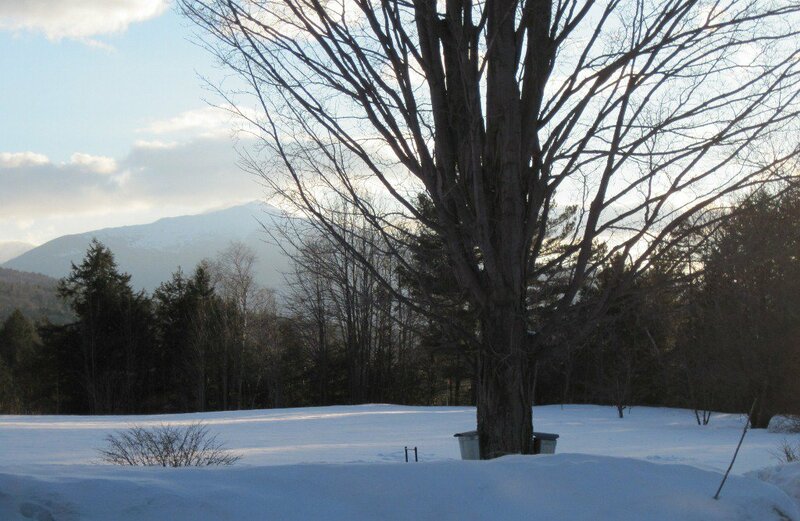 This entry was posted in Life of an Innkeeper and tagged Bed and Breakfast Events, Inn to Inn tours, Innkeeping, Maple, Maple Events in New Hampshire, Maple Sugar events in New Hampshire, Maple Sugar Packages at Bed and Breakfasts in the White Mountains, Maple Sugaring in New Hampshire, Maple Sugaring in the White Mountains of NH, Mt. Washington Valley, Travel, vacation. Bookmark the permalink.